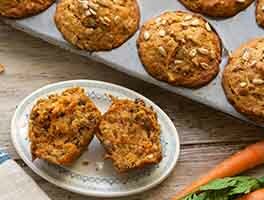 This recipe is a taking-off point; use it to create your own favorite muffins by adding fruits and flavorings, nuts and vegetables, or substituting various grains. 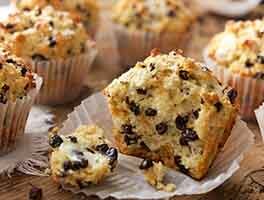 Muffins, being so easy and quick to make, are wonderful for experimenting. For instant gratification, of both the taste buds and the creative spirit, nothing beats a muffin! Preheat your oven to 425°F. Lightly grease the cups of a standard 12-cup muffin pan. Or line the cups with papers, and grease the papers. Blend together the dry ingredients. Beat the liquid ingredients together — milk, oil or butter, eggs, and vanilla — until light. Pour the wet ingredients into the dry ingredients. Take a fork or wire whisk and blend the two briefly — about 20 seconds should do it. The secret to light and tender muffins lies in blending together the liquid and dry ingredients gently. It's OK to leave some lumps that look as if they want more stirring; they really don't. So, no matter how hard it is, resist the impulse. Fill the cups of the muffin pan two-thirds to three-quarters full. Sprinkle with sparkling white sugar, if desired. 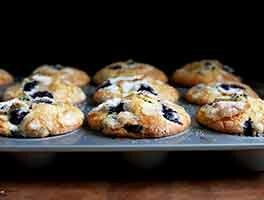 If you leave the oil out, you can reduce the calories in your muffins by about 30%; the flavor will still be excellent, but muffins won't be quite as tender, and won't keep as well should you happen to have any left over. To make berry or fruit muffins: Add 1 1/2 cups of berries to the recipe (or finely chopped, well-drained fresh fruit: peaches, apples, etc. ; or chopped dried fruit; or Jammy Bits, sweet, soft little morsels of fruit purée). To make sure berries or fruit stay evenly distributed throughout the batter, add to the dry ingredients and mix until coated before adding the liquid ingredients. This prevents them from sinking once the liquids are blended in. 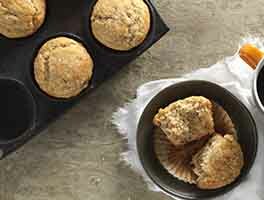 To make oatmeal muffins: If you like the old-fashioned taste of oats, you'll love this easy variation. Instead of using 2 cups of flour, use 1 cup rolled oats and 1 1/4 cups flour. If you like a heartier muffin, substitute brown sugar for granulated. 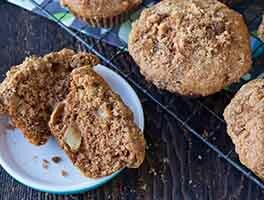 These muffins don't rise as high as the basic muffins, but they certainly taste wonderful! just made this and they turned out great. I added raspberries and lemon to one batch and blueberry and oats to the other. I'll use this recipe again! I've made these muffins a dozen times now. Always come out perfect! I've never stuck with the plain recipe, but have always followed the guidelines for adding fruit. Blueberries and strawberries have had awesome results. I like to add the zest of a lemon or two as well. Sometimes I add a little freshly grated nutmeg and cinnamon. It just depends on my mood. Whatever you do, please do not over mix these! They are super serious about that part in the directions! Be gentle and you'll end up with perfectly fluffy muffins. Great go-to muffin recipe with whatever I have on hand. They go together quickly. I used a can of peach slices drained and chopped up this morning. Worked great! This recipe is exactly what it is named, basic muffins. It is a great starting point for adding your own flavors and additions. The background flavor of the muffin is neutral, and any flavoring you use will add more depth. The muffins bake up beautifully, deep golden brown with a nice high muffin top crown. I did not use liners, but removed the muffins from the pan within 5 minutes and they held up perfectly. I will be using this recipe again and trying different variations. 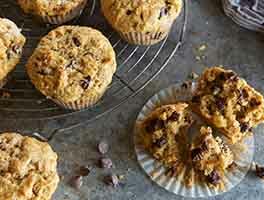 We love the flavor of these muffins! I have made blueberry and banana-nut so far. They seem a tad dry and I would like to add more moisture for a more cake like texture. Suggestions? They stick to paper liners and I will be baking them in silicone or parchment from now on. Dear spouse was late getting started this morning so I started breakfast prep without him. Tried this recipe and for a nice surprise I added about a cup of cinnamon chips. Such a wonderful, versatile recipe and super easy and fast. Muffins were in the oven before he got out of the shower. Baked by the time the bacon was done. Talk about delicious! We loved them. They rose high, were crispy on the outside, fluffy inside. I sprayed the muffin cups with cooking spray so the paper peeled right off. We give these muffins a five "yum" rating. Adequate and easy but very bland and wouldn't recommend with paper cups as half the muffin stuck to the cups. I used the recommended amount of blueberries and found that the end result was rather tasteless. I an windering why one Tablespoon of baking soda was included in this recipe when cimpated to others on this blog that use much less. I did the oatmeal version with some tweaks: (1) put 1 tablespoon flax meal in the cup before measuring oatmeal (2) used 1/4 cup KAF buttermilk powder instead of milk (3) added a couple tablespoons homemade applesauce (4) cut the butter to 2 1/2 tablespoons (5) used sweet marsala (left over from holiday cooking) instead of vanilla (6) added cut up dried plums and cherries VERY tender and tasty. Next time I will cut the butter to one tablespoon. Definitely my go-to basic muffin recipe from now on! Unexpected kiddos in the house had me scrambling for easy homemade snack while avoiding a trip to the store. I had almost a half a bag of semi-sweet morsels in the cupboard so chocolate chip muffins it is! Even the adults pounded them! I made them in a silicone mini muffin pan and they turned out great. Thanks, KAF!